Despite the heat, I did quite a lot of baking this weekend. I took pictures of most of it as I went along, but Jeremy has those pictures on his laptop, so they’ll have to go in another post. I do have a few pictures from Sunday, though, so I’ll talk about that. 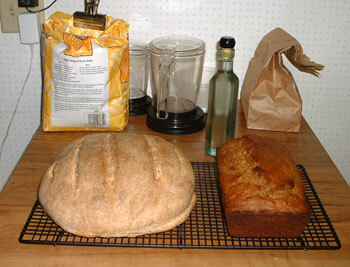 The picture above shows a loaf of sourdough on the left, and banana bread on the right. I actually started the sourdough on Saturday, feeding the starter and making a sponge for the bread that fermented overnight. On Sunday morning, I got up and kneaded dough in my pajamas, adding about 1/3 cup of flour and some wheat germ to the bread flour for good measure. The dough rose beautifully, and when it was threatening to spill over the sides of the bowl, I punched it down, shaped it, and left it for the second rise. It baked up beautifully, though we have yet to taste it: I’m going to slice some of it up for pesto garlic bread with dinner tonight. PS: Behind the breads you see a corked glass bottle that once held Mexican vanilla. We used the last of it this week, and Jeremy talked me into filling the bottle with liquid sugar to pour in our tea. I obliged, and made a simple sugar syrup at a 1:1 ratio of sugar to water, boiled until thoroughly dissolved. It works fine, but it still sinks to the bottom of the cup like granulated sugar does, and makes rather a sticky mess on the bottle when poured. Oh well. 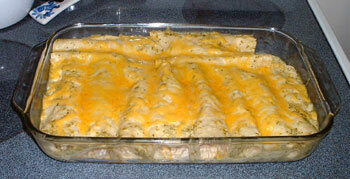 This was Sunday dinner, my first ever attempt to make chicken enchiladas. I used a Cooking Light recipe from the same collection as the banana bread, and got much better results than with the former. The recipe calls for simmering bone-in chicken breasts in water with bay and peppercorns to make it tender enough to shred, and I made extra while I was at it, to freeze with the resulting broth for chicken soup this fall. The sauce was made very quickly with canned tomatillos and chiles, whirred up with milk and an egg using my stick blender. Then I assembled the enchiladas, dipping each corn tortilla briefly in a skillet of hot water before spooning a mix of chicken, cheese and onions in the center and rolling it all up. I poured the sauce over the lot, covered it in foil, and was surprised to see that after 20 minutes in the oven, virtually all the sauce had been absorbed into the tortillas. Although this initially made me quite nervous, they came out very moist and flavorful, and not too spicy for my sensitive tongue, so all was well. Bring on the leftovers!